Sounders defensive midfielder Osvaldo Alonso is legendary for clogging up the middle of the field and making life miserable for opposing attackers. They'll need Alonso and Gustav Svensson at their best against the Portland Timbers and star scorer Diego Valeri. Sounders coach Brian Schmetzer was giving an emotional postgame talk to players in an otherwise-stone-silent locker room last Sunday on why they’d pulled out a last-second, bye-clinching win over San Jose when a lone voice interrupted him. “It’s because they have huevos,’’ team captain Osvaldo Alonso blurted out solemnly, using the Spanish word for “eggs’’ but meaning to imply fortitude. Few players dare interrupt any coach mid-sentence, but Alonso’s opinion matters on a squad where he’s toiled a decade alongside Schmetzer, who quickly agreed with the captain’s assessment. Alonso, who turns 33 this month, is the lone remaining regular — Lamar Neagle hasn’t played in months — from a Sounders team ousted by the Portland Timbers in 2013, their only prior meeting in the Major League Soccer playoffs. And the way a rejuvenated Alonso has played lately, securing a finalist nod for MLS Comeback Player of the Year, he could be the main thing keeping this year’s Sounders from a similar fate. The Timbers outplayed the Sounders all three times they met this season — winning twice — and defensive midfielders Alonso and Gustav Svensson slowing down Argentine playmaker Diego Valeri will be a must in Sunday’s opening-road leg of the Western Conference semifinal. Valeri scored twice for the Timbers in their 2-1 win at FC Dallas in a midweek knockout game. He also tied for the team lead with 10 regular-season goals and added a club-high 12 assists, three of them coming against the Sounders in a 3-2 defeat the Timbers handed them back on June 30 at CenturyLink Field. The Sounders rallied to go 15-2-2 since, with the return to health of Alonso having plenty to do with it. What Alonso is particularly adept at is gumming up the middle of the field before opposing attackers such as Valeri get going. As Toronto FC midfielder Michael Bradley reminded everyone in last year’s MLS Cup final, no matter how many goal-scorers your lineup has, soccer games are won and lost in the middle of the field. Bradley was all over the place that day, and the hapless Sounders rarely had the ball longer than a few seconds before surrendering it. 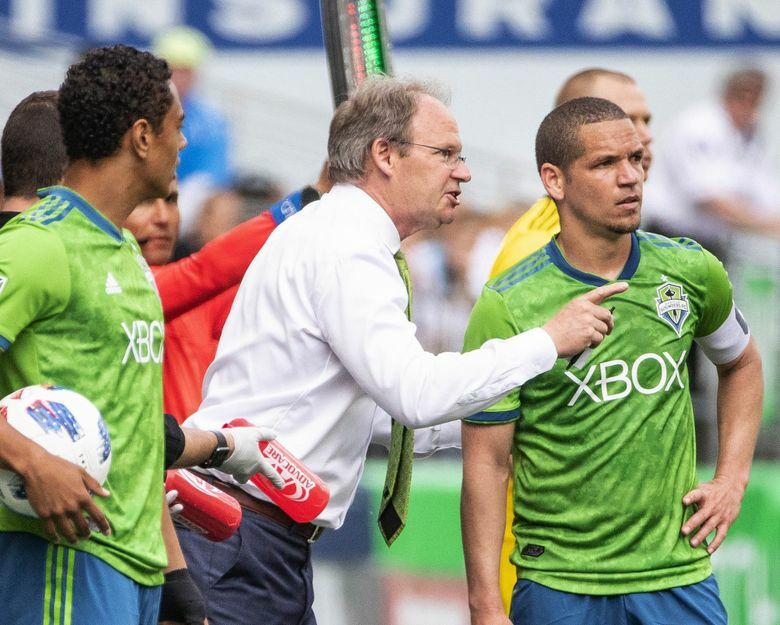 Alonso in his “honey badger’’ heyday was exactly that type of player for the Sounders, who missed him badly at times in the 2017 regular season and throughout the playoffs against superior teams such as Toronto. Svensson came up big at times for the Sounders in last year’s postseason, scoring a huge conference final goal at Houston to open the scoring in that two-leg series. He was paired back then in the defensive midfield with Cristian Roldan, who has been bumped up a line to right wing to clear room for Alonso. That veteran experience throughout the middle gives the Sounders an edge they lacked last year and could propel them that extra step to a championship. But first, they must get by an arch-nemesis Timbers side that beat them 5-3 on aggregate in that 2013 series and has won half the four postseason rounds between the sides across all eras since 1975. Also, since the knockout round was introduced in 2011, teams winning it have gone on to beat squads coming off byes in 10 of 20 ensuing playoff rounds. One theory for that statistic is that teams winning midweek knockout games have momentum on their side and get to play opening-leg home games against the higher-seeded bye teams. Svensson said he doesn’t mind starting on the road, where the Sounders defeated Houston 2-0 in last year’s conference final opening leg in which he scored the second goal. Perhaps, but with Timbers defender Larrys Mabiala out on red-card suspension, Schmetzer might be tempted to push forward for a crucial away goal — the first aggregate score tiebreaker — and trust Alonso and Svensson to thwart any counterattacks. Schmetzer will have the same starting lineup as he did against San Jose, with injured left back Brad Smith more likely to play in Thursday’s second leg at CenturyLink Field. That means — especially on the defensive side — he’ll need Alonso once again turning back the clock again and relying on “his ability to dictate the tempo part of our game and possession from that area of the field. “When Stef (Frei) gets the ball on goal kicks we want him to put it down and get it into play. Get it to Ozzie’s feet, get it to Gustav (Svensson)’s feet and that’s the play right away,’’ Schmetzer said. Schmetzer said Alonso’s game has matured to where his pass completion percentage is statistically “off the charts,’’ and that he’s also improved his entries into the final third of the field. Some of that carrying the ball forward, he added, is due to Alonso gaining trust that Svensson will fill in behind him. “It’s been a plus for us,’’ he said. And the Sounders will take any edge they can find to get past a bitter rival and forge a path toward a third consecutive MLS Cup final.